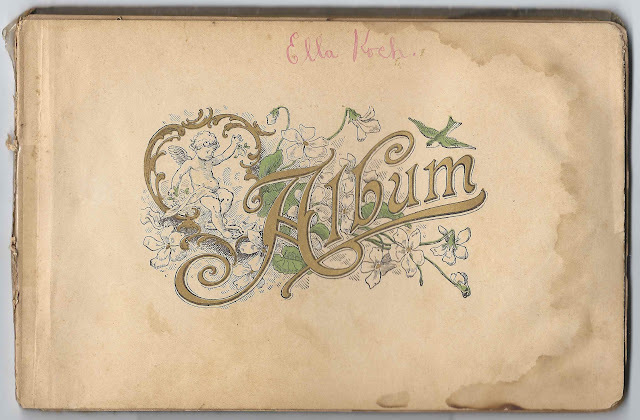 1901 autograph album of Ella Koch of Sawyer, Wisconsin. She wrote her name on the title page. Thanks to a reader, I learned that Sawyer was a town in Door County, Wisconsin. The reader further noted that the Door County Library newspaper archive contains mention of Ella Koch and other signers, in case you want to do further research. Example here. 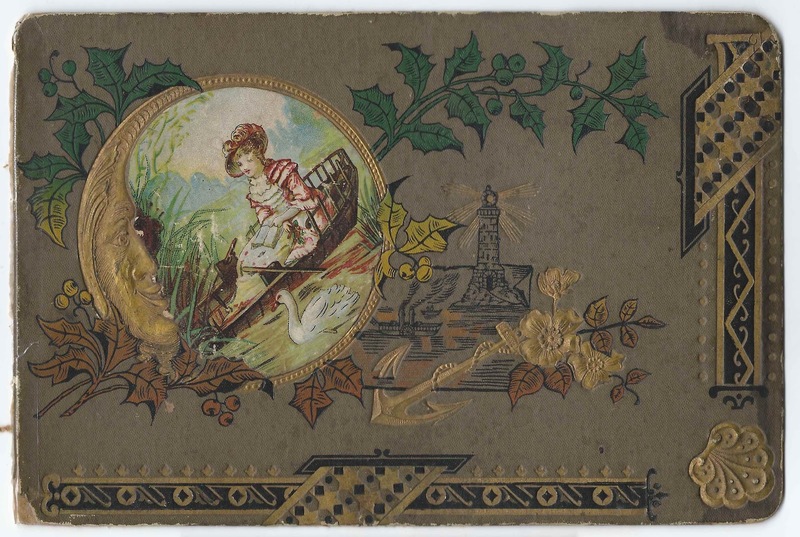 The album is approximately 9" X 5-3/4" and contains the sentiments of 29 of her relatives, friends and schoolmates. An alphabetical list of the signers appears at the end of this post. Ella Koch was born about April 1891 in Michigan, the daughter of Matthias P. and Elizabeth, "Lizzie", Koch. Matthias was the son of John M. and Victoria Koch, immigrants from Wurttemburg, Germany. 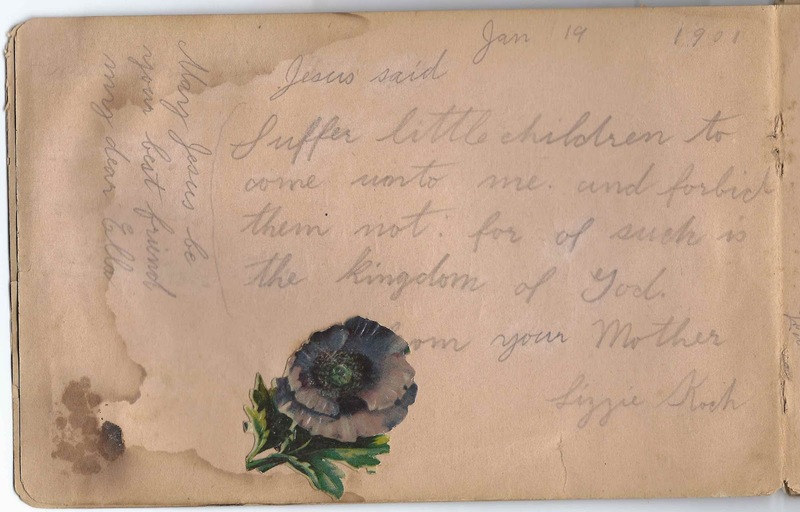 I haven't yet determined Lizzie's maiden name or parents. 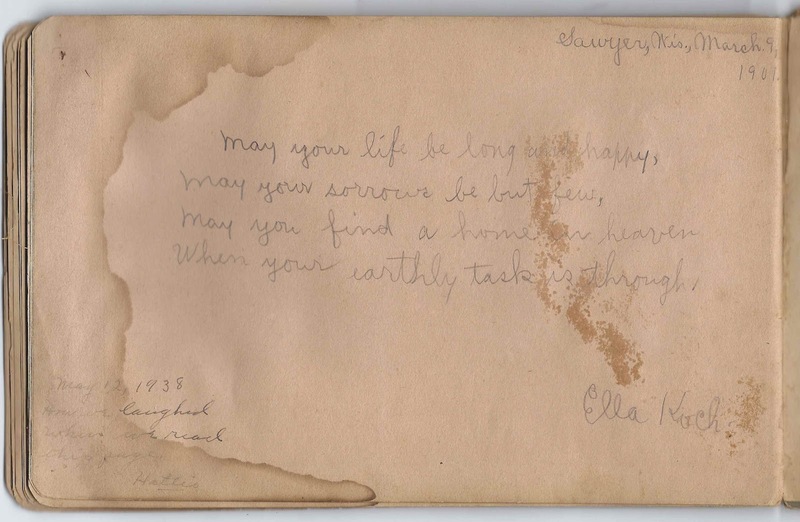 She signed a page in Ella's album on 19 January 1901. Sister Elsie signed a page at Sawyer, Wisconsin, on 29 January 1901. I don't know if Elsie was a full sister, half sister, step sister or other kind of sister, as I didn't find her in the Koch household in 1900. 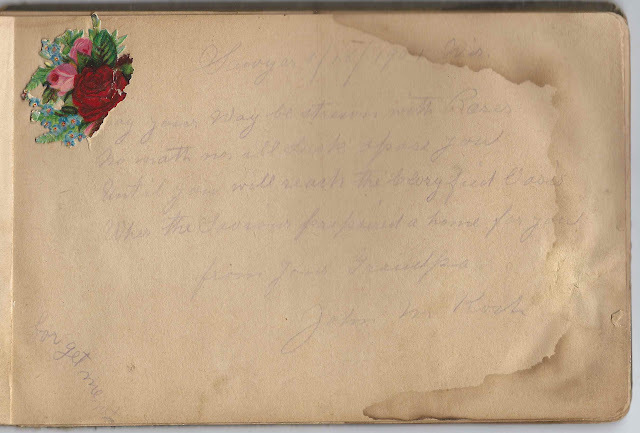 Ella's paternal grandparents, John M. and Victoria Koch, each signed pages in her album at Sawyer, Wisconsin, on 18 January 1901. At first I thought that John might have been the Johann Martin Koch who emigrated to the United States in 1853, born at 16 April 1836 at Trossingen, according to the Wurttemburg, Germany Emigration Index. The 1900 Census gives April 1836 for Johann's birth month and year, although the year is often by a year on either side. However, there would have to be two of them by that name in Wisconsin, as an online discussion about a Johann Martin Koch indicates he married Elizabeth Korth. I don't have Victoria's maiden name, but she signed "V. C. L. Koch". Ella's uncle, A. H. Koch, signed a page. He was Ella's father's younger brother, Andrew H. Koch. 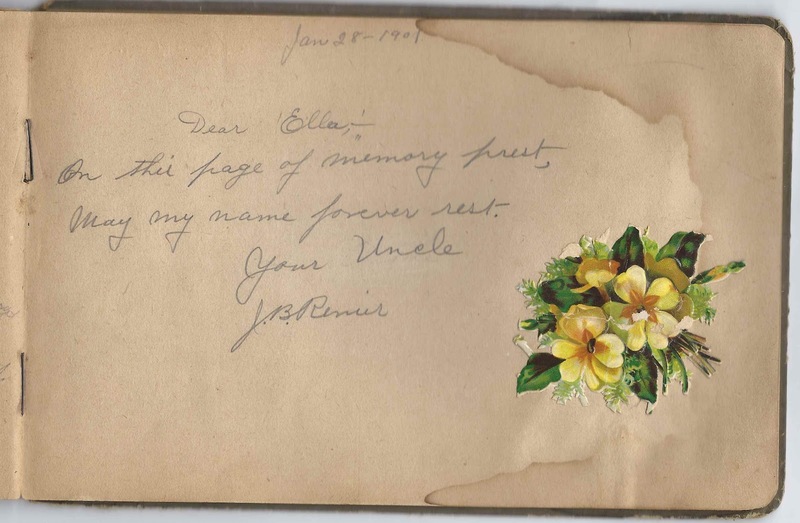 Two people who signed facing pages called themselves Ella's aunt and uncle. They were Mae Renier and J. B. Renier, who signed pages on 28 January 1901. Another aunt, Amelia Roder or similar surname, signed a page at Sawyer, Wisconsin, in April 1901. 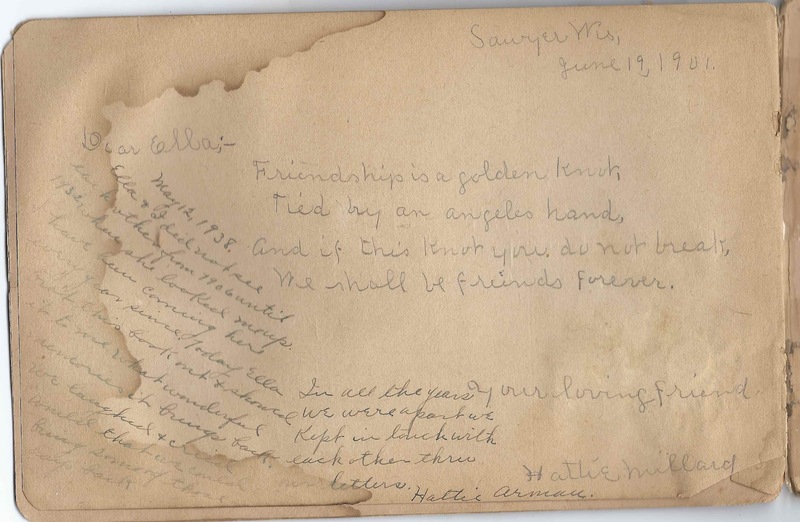 Ella's childhood friend Hattie Millard signed a page at Sawyer, Wisconsin, on 19 June 1901. 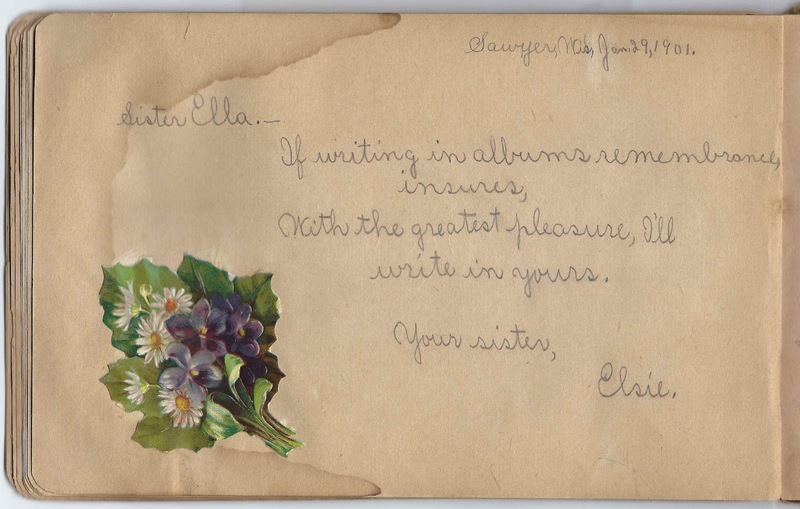 What makes her page special is that she and Ella apparently got to visit each other for the first time in years in 1938, and Hattie added a note to her page. Hattie had married Enos Milo Arman. Ella herself signed the last page in her album at Sawyer, Wisconsin, on 9 March 1901. Hattie added a comment in 1938. I believe that Ella married Donald MacMillan sometime after 1910, when she was still single and living with her parents at Sturgeon Bay, Wisconsin, according to the 1910 Federal Census. The 1920 Census shows Ella and her husband Donald MacMillan living with Ella's parents at Menominee, Wisconsin. There was a Donald MacMillan, born about 1915, living in the household. I don't know Ella's marriage date, so I don't know if Donald was her son or her stepson. If you have corrections and/or additions to the scant information above, or information on any of the signers listed below, please leave a comment or contact me directly. Thanks! Edna Brewster, signed at Sturgeon Bay, Wisconsin, on 16 February 1901; "your chumb"
Ella Koch of Sawyer, Wisconsin; album owner. She signed her name on the title page and also signed the last page in the album, at Sawyer, Wisconsin, on 9 March 1901. 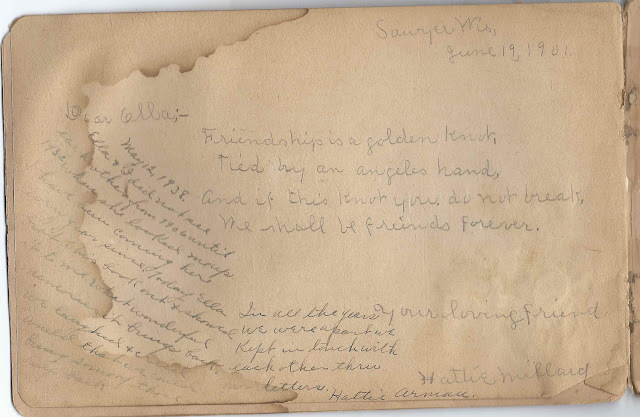 Her friend Hattie (Millard) Arman added a note in 1939. Hattie Millard, signed at Sawyer, Wisconsin, on 19 June 1901. 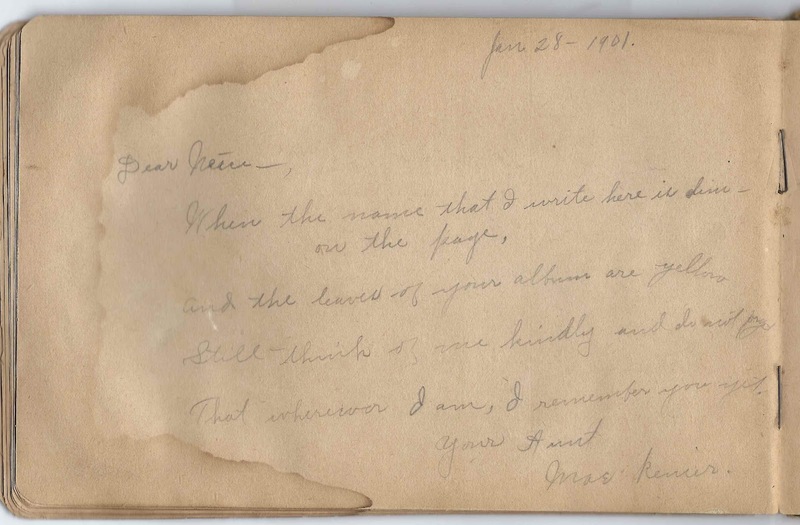 Hattie posted an update in 1938 when she was Hattie Arman [husband Enos Milo Arman.]. Ella and Hattie had kept in touch all through the years but had not seen each other until 1938 when Ella brought the autograph album to show Hattie. Frank Schultz; called himself Ella's brother. 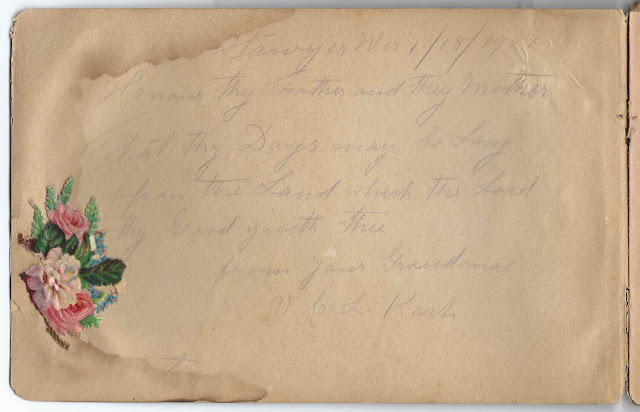 Minnie Wetteland, signed at Sawyer, Wisconsin, on 16 March 1901; "your chumb"
Sawyer was a town in Door County, Wisconsin. The Door County Library's newspaper archive has many articles about Ella Koch and the other signers. So fascinating. Neat! Thanks so much for taking the time to comment and provide the information about the newspaper archive. I'm amending the post to reflect your comment.